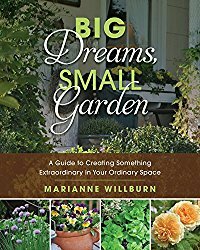 For our March 2017 Washington Gardener Reader Contest, Washington Gardener is giving away a signed copy of Big Dreams, Small Garden: A Guide to Creating Something Extraordinary in Your Ordinary Space (prize value: $17.99). How do passionate gardeners struggling with limited resources manage to put aside feelings of inadequacy and envy, and begin to create an oasis in the midst of numerous obstacles? In her debut book, columnist and blogger Marianne Willburn presents a comprehensive step-by-step plan for creating an ideal garden in less-than-ideal circumstances—encouraging the discouraged to pick up their trowels and get on with it. With humor and irreverence, she painlessly guides readers to make a deeper connection with the places they call home, letting go of limiting emotions, and embracing a new perspective, and in doing so, makes a case for one of the longest relationships in human history—that of our relationship with the soil. To enter to win a signed copy of the book, send an email to WashingtonGardener@rcn.com by 5:00pm on March 31 with “Big Dreams, Small Garden” in the subject line and in the body of the email. Tell us what your favorite article was in the March 2017 issue and why. Include your full name and mailing address. The winner will be announced on April 1. I have two garden talks this week that each still have spaces open. I hope you can join me for one or both of them. Register ASAP to reserve your spot. 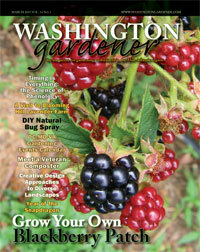 Taught by Kathy Jentz, Editor/Publisher, Washington Gardener Magazine. Beginner to intermediate gardeners are often overwhelmed by the long spring to-do lists of garden tasks. This class will cover which chores are essential and which ones can you safely skip. Topics include cost-saving tips and tricks; the best plants for our region; how to give them a successful start on life, and soil preparation and testing. Fee: $22. This event will be held at Brookside Gardens in Wheaton, MD. Register at http://www.montgomeryparks.org. 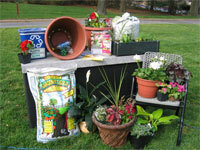 Washington Gardener Magazine's Editor/Publisher Kathy Jentz shares tips on how you can grow beautiful garden containers. Learn what types of soil to use, pros and cons of different containers, and which plants perform well in our region. Kathy shows you the basics and goes into details of growing ornamental and edible containers while showing you styles and fashions in container gardening. $15/person. Register online at www.fairfaxcounty.gov/parks/parktakes using code 2902892901 or call 703-642-5173. Green Spring Gardens, 4603 Green Spring Road, Alexandria, VA. The March 2017 issue of Washington Gardener Magazine is now out. Predatory Mites to the Rescue! Note that any submissions, event listings, and advertisements for the April 2017 issue are due by April 10. On March 9th, Washington Gardener staff headed over to Brookside Gardens in Wheaton. MD, to donate a variety of gardening books on topics including bonsai gardening, pollinator plants, native gardens, and houseplants--along with garden books for children. This year’s donations adds up to a total value of $466.40 (so far). 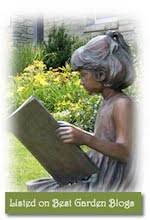 By the close of 2016, Washington Gardener gifted $683.01 in books and, in 2015, the book donation totaled $534.99. The biggest yearly donation yet was in 2013, with $3,070.94 in books given. Several of the books that editor and publisher Kathy Jentz donates to the library have been previously reviewed and featured in magazine editions. Check out the latest book reviews of Chinese Kitchen Garden by Wendy Kiang-Spray and Miniature Moss Gardens by Megumi Oshima and Hideshi Kimura in the March 2017 edition of Washington Gardener. Primrose: You Can Grow That! Primrose are a cold hardy perennial for us in the Mid-Atlantic USA, that is also widely sold as a houseplant at local supermarkets and garden centers. At just $2-4 each, I buy several and use them to decorate my home with flowers during the depths of the winter doldrums. Then, when they stop flowering, I plant then out in the garden in a moist, part-shade spot. 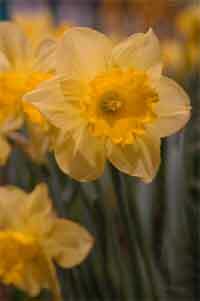 They come back reliably each year with little/no care and bloom about the same time outdoors as they did inside. One extra step I do for them inside is that I pinch out any spent blooms as I come across them during weekly waterings. This seems to encourage more and longer flowering from the plants. This year, rather than compost these sweet little plants, why not plant them out in your garden and be rewarded with blooms for years to come?